In Google, type in “does vinegar spoil?” and a variety of results pop up. While responses vary in length and detail, the general consensus is “no”. This consensus is generally accurate, with a few caveats, that I will explain below. The source of most information about vinegar’s shelf-life comes from a statement on the website of the national association of vinegar manufacturers, the Vinegar Institute. In the interest of full disclosure, I will mention that as a vinegar manufacturer I am a member of the Vinegar Institute. The Institute conducted studies on the shelf-life of vinegar as it relates to its acidity–the most important measure of its shelf-life. Standard vinegar is 5% acidity and 4% is the minimum allowed for sale per FDA guidelines. What the Institute found was that vinegar has a nearly indefinite shelf life (read: years) and though color may change and sediment may form, the safety of the vinegar was not compromised though the taste and quality may change. This is correct since the main component of vinegar, acetic acid, is relatively stable under the right conditions. Vinegar makers have long known this. Many fine vinegars are aged for years, if not decades. Balsamic Vinegar of Modena IGP is required to be aged at least 60 days before sale. The high-quality expensive Traditional Balsamic Vinegar of Modena or Reggio-Emilia (DOP, not IGP) is required to be aged at least 12(!) years. It costs $100+ for a reason. Similarly many Chinese vinegars like Zhenjiang (Chinkiang) and Shanxi vinegars are aged 3-6 years for various products. Aging actually enhances the flavors of vinegar, especially if done in certain wood or ceramic containers. 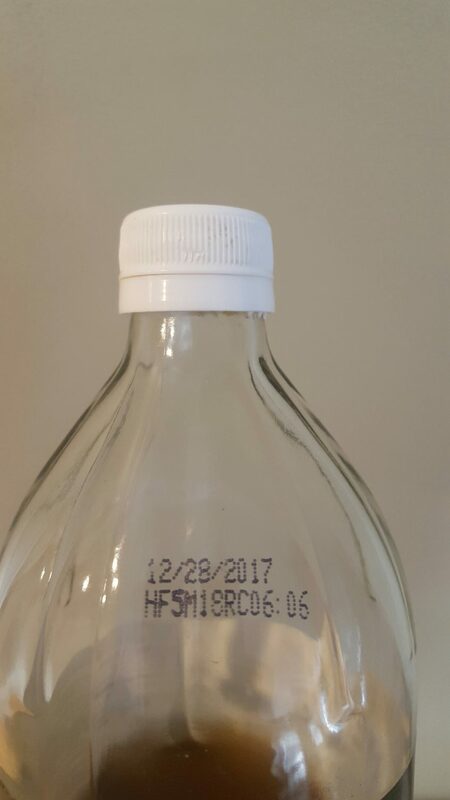 Now, if you buy vinegar in any store, typically you will see a “Best By” date. This date, by convention, for most manufacturers is two years from the production date. This date is a recommendation to distributors, retailers, and consumers about recommended life for the vinegar. Mostly it is for liability and guarantee purposes and not related to any chemical or biological degradation process. While vinegar can keep for years, no one wants their vinegar sold or returned a decade from now, especially if they don’t know how it has been stored. So while no one will warranty or recommend you use vinegar past its Best By date, it is possible it is still good. The longest shelf life is white distilled (a.k.a. spirit vinegar) since there are few other organic compounds to cause random reactions to affect quality. Other vinegars can last as long if the acetic acid content is stable but can have various changes over time. What types of changes? Color: if you look at the back of most non-organic, non-raw red wine vinegars you will see “Contains Sulfites”. While this is no different from similar declarations on most wines, you would be forgiven for thinking the sulfites were only a byproduct of the original wine used. When vinegar makers use wine, we typically want to eliminate or minimize sulfites since their very purpose is to inhibit the bacteria that make vinegar. However, when red wine vinegar is made by modern processes like the submerged vinegar manufacturing process, its color tends to not be stable. After red wine vinegar is made, sulfites are added to help keep the vinegar’s color stable through its shelf life. Otherwise it turns a light red over time, looking like reddish apple juice. If you ever want to test this, pour some cheap red wine vinegar into a jar, add a few drops of hydrogen peroxide and wait about a week. The hydrogen peroxide removes the sulfites and the vinegar color will soon change from its nice red. This change is harmless though and does not affect the acidity of the vinegar. Other vinegars can change color too, often by a process known as the Maillard reaction. There are residual sugars and amino acids in many fruit vinegars that will cause a browning over time not completely dissimilar to the browning you see when you bake food. This can take months if not years though to happen. Sediment: many vinegars are ultra-filtered to make them clear, but this also removes some flavor and nutritional compounds. Those vinegars that are not ultra-filtered can form sediment over time as floating particles settle. Also, some dissolved compounds can slowly precipitate (become solid and sink) due to the slow progress of the reversible rate of the dissolving in solution. This is all harmless as well. Mother: most vinegars are pasteurized unless stated otherwise. For those vinegars without mother, sometimes pasteurization is incomplete or they are re-inoculated with vinegar bacteria from the air after opening. If there is any residual alcohol (0.2% – 0.3% residual alcohol is an industry norm), a mother will slowly form and likely sink. This is harmless as well and some would even argue beneficial. So the above quality changes are common but do not affect the vinegar’s safety and use. So how can vinegar spoil and become unsafe to use? There are a few main processes which while not common, should be protected against to maximize the vinegar’s shelf life. Overoxidation: the vinegar bacteria consume alcohol to make vinegar. Alcohol is their food source so you would be believe they lay down and die when the alcohol is substantially exhausted. This is not always so. Some species of vinegar bacteria can engage in a type of metabolism called overoxidation. This is a process by where once they run out of alcohol, they can begin consuming acetic acid and leaving only byproducts of water and carbon dioxide. This gradually dilutes the acetic acid, eventually lowering acidity to a danger zone where bacteria and mold thrive. This is generally only a problem in vinegar manufacturing but can affect home vinegar over long time periods. When storing for long periods, store in a jar or jug that is tightly sealed to air and has limited air space above the vinegar in the jar or jug. Without oxygen, the bacteria can’t metabolize anything and this drastically extends shelf-life. When aging, vinegar is removed from most oxygen for this very reason. Inappropriate storage materials: vinegar should typically only be stored in stainless steel, glass, food safe plastic (HDPE or PP only), or wood. Anything else, especially metals like copper, brass, iron, or aluminum will cause problems. Acetic acid will corrode the metal, reacting with it to form salts called acetates. Not only are many acetates harmful, the reaction reduces the acetic acid content lowering the acidity. Unsealed bottles: acetic acid can slowly evaporate like anything else so leaving a bottle open or not properly closed can gradually lead to lower acidity. In summary, if you keep your vinegar in a tightly closed container it should keep for a long time. For raw vinegar it is important to limit exposure to air from outside and within the bottle. While a small to medium sized air pocket in a jar or jug is typically no big deal over shorter time periods (and the vinegar will probably consume it with little change) leaving a relatively small amount of raw, unpasteurized vinegar in an otherwise empty or not tightly sealed container for a long period is not a good strategy as the bacteria could eventually reduce the acidity below usable levels. The less vinegar in the jug, the faster the overoxidation will proceed. For longer term storage transfer this smaller amount to a more appropriate sized bottle with less air exposure. This is interesting info. Where can I purchase vinegar with mother? You can purchase Supreme Vinegar mothers of vinegar on either Amazon (search for Supreme Vinegar mother of vinegar) or call your local homebrew shop. We have wide distribution in homebrew shops across the USA. I appreciate your generosity in sharing it. I have been making pepper vinegar for years. I start with retail plain white vinegar from the store and then add peppers, garlic, and other spices to make a very delightful mixture. I have some bottles that I made over 20 years ago. Is there a great possibility that these bottles will be dangerous to consume? I experiment with other mixtures. One of my favorites is ginger. I have some of this dating back about 20 years as well. I just made a basil vinegar yesterday that is sensational. Do you have advice on how to insure maximum safety? Hi, it is hard to tell without measuring the acidity. If the bottle remained airtight over the 20 years, there is a good possibility it is ok. Email me at vinegarmaking@supremevinegar.com and you can arrange to send a sample for testing. To ensure long term acidity, keep the bottle/jar tightly closed not allowing any extra air to enter. Hello… I m worried because I have a large vat (many gallons) of raw apple cider vinegar I used to infuse some roots and spices and, while I placed a lid on it and strapped that lid down with a ratchet strap, it’s not airtight. It has been three months now and I am going to bottle it immediately. Do you think that three months is enough to have decimated that vinegar or is it still salvageable? Thank you! If it is a large vat and strapped down, it may still be ok after 3 months. Even if it is not airtight, check to see how big a mother has formed since that will tell you roughly how hard it has been fermenting. If there is not additional mother, fermentation may have been very slow and you might be ok. Check the pH. If significantly higher than 3.5 you may have issues. The best thing to do honestly is ship a small sample to a wine lab that will measure acidity for about $20. That way you can be certain.